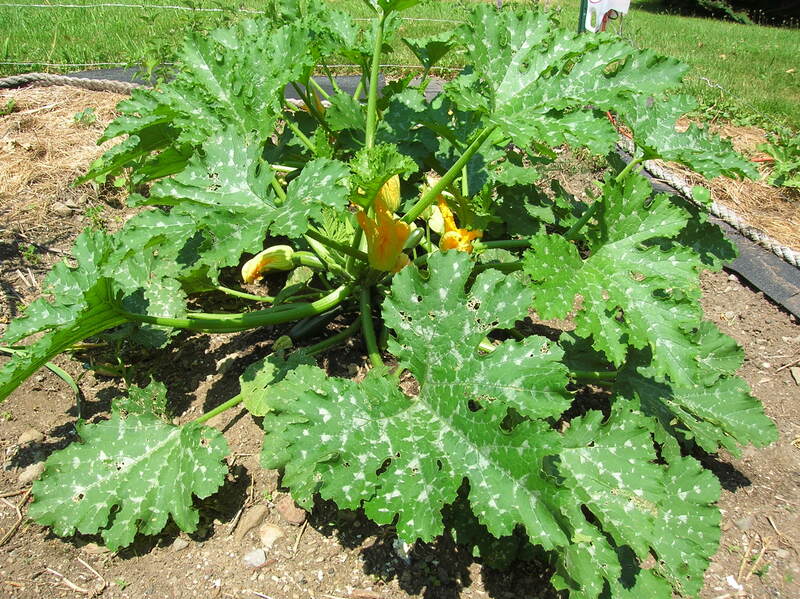 Yes, it is that time of year again, time when folks around here are sure to lock all their doors and close their windows lest some zucchini “vandal” strike by leaving a surreptitious gift of zucchini from the garden. Our own vegetable patch has been pumping out the green squashes with a regularity to rival that of the season’s other excess crop: campaign speeches. 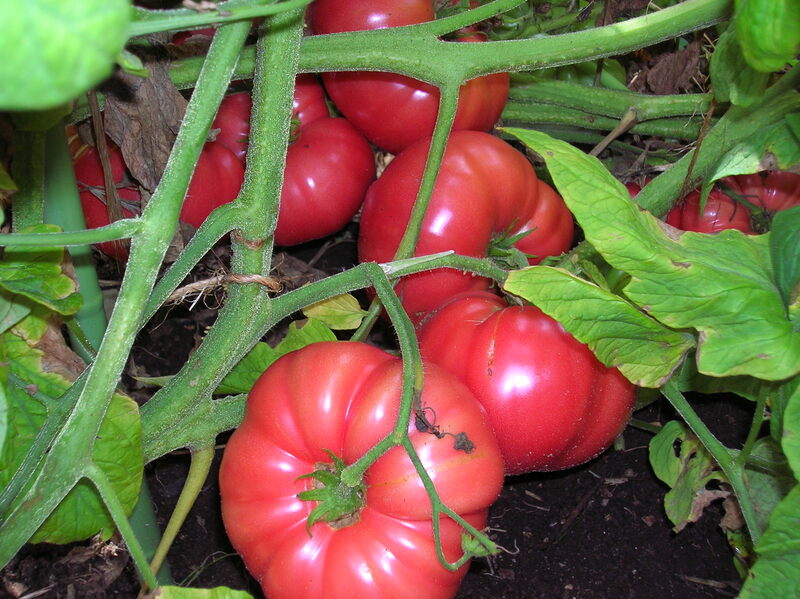 We’ve tried a new variety this year, ‘Astia’ from Renee’s Garden seeds. This tidy little French bush variety was developed for container growing and small-space gardens. The non-rambling, compact squash vines are ornamental, early bearing and productive with a capital “P” producing plenty of glossy green fruits. I am sold on ‘Astia,’ and I’ll never grow any other variety again. As always I have go to great lengths to disguise zucchini for the finicky eater of the family. I grate it to add to corn muffins, fruit breads and pancakes. The finely grated zucchini “disappears” and adds a subtle richness to these baked goods. Try freezing grated or finely diced zucchini in one-cup amounts to use throughout the winter. 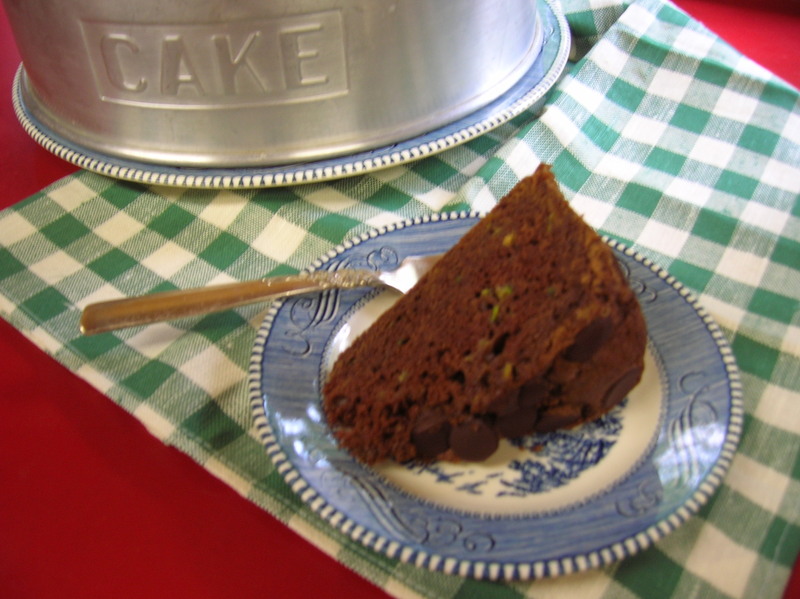 Though I heard yeas ago of using zucchini in a chocolate cake, it was only yesterday that I resorted to this ultimate example of trickery. But oh my goodness! Why did I wait so long? This stuff is heaven. I tinkered just a bit with two recipes to come up with this one that is even better the second day. Lightly grease and flour a round 10-inch springform baking pan. In a small bowl, stir together the flour, baking powder, baking soda, salt, cinnamon and cocoa. In a large separate bowl, combine the sugar, oil, eggs, sour cream and orange extract, mixing well. Did you know that what you put on your lawn — fertilizers, herbicides, fungicides and pesticides — can wash out and eventually show up in surface waters? Of course yard and lawn chemicals are just one component of water pollution sources, it is one you can control. 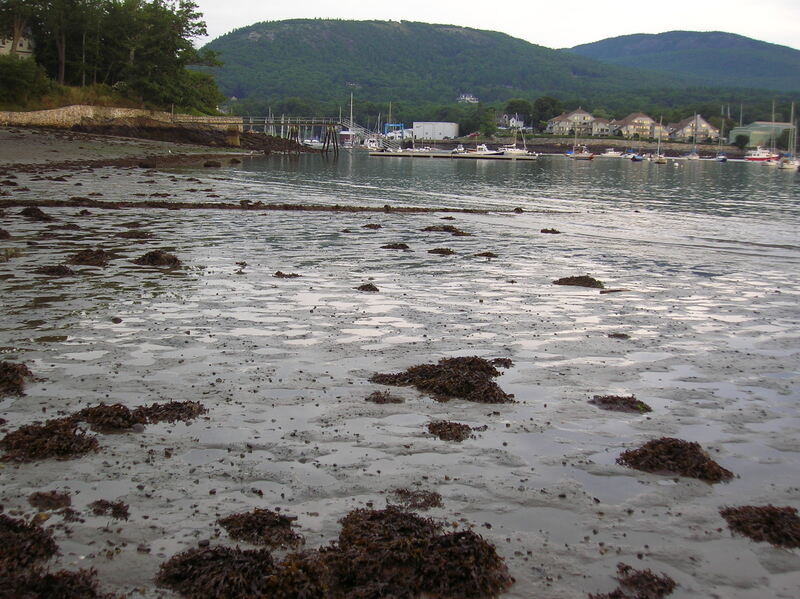 This summer we have joined a league of residents throughout the state who are monitoring area beaches for water quality issues for the Maine Healthy Beaches (http://www.mainehealthybeaches.org/). Check the website for information on area beaches. It only takes a few minutes a week to help monitor, and ultimately protect our water resources. We check air and water temperatures, salinity levels and take water samples for anaylsis. Even if you cannot take part in the program, you can contribute by using fewer, if not eliminating entirely, those chemicals you spread on your lawn. By using herbicides that restrict grass species, you run the risk of creating a mono-culture of a lawn that is even more susceptible to disease issues. 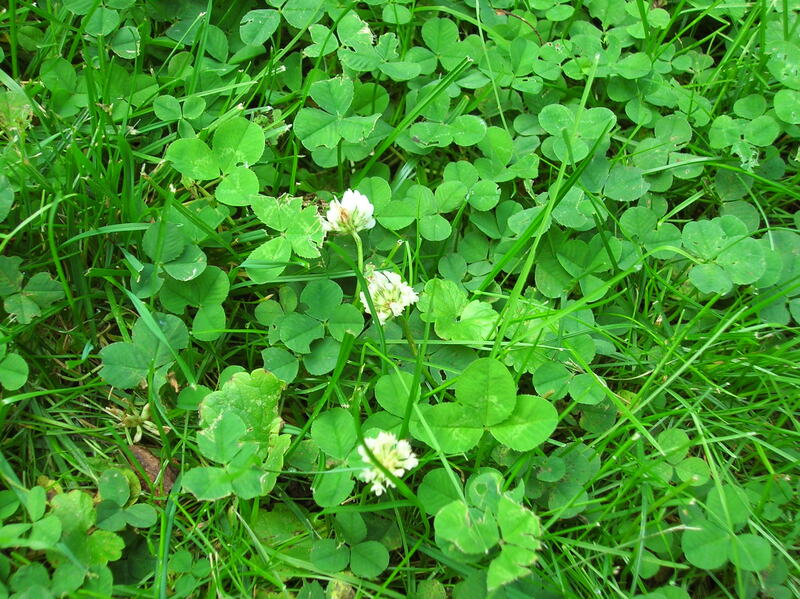 A mix of grass and other plants such as Dutch clover helps ensure a green lawn all summer. Trust me, an application of lime is better for that lawn than just about anything you can use. Lime “sweetens” up the soil, and by doing so enables the grass (and other plants) to utilize more of the nutrients in the soil. Another thing you can do to get a greener lawn is to cut higher. We mow our lawns not because they get too tall, but because they get uneven. The taller the grass, the longer its roots. When you cut the grass too short “scalp” the grass you end up with fewer, shorter roots that cannot withstand heat and dry conditions and you end up with brown spots. It’s easy and the impact can be far-reaching. We’ve got worms! Tomato worms have set up camp and are attacking our tomato plants. We could bomb the heck out of them with pesticides, but then who would want to eat the tomatoes left in that wake? But we have to do something because a few tomato worms can strip tomato plants in a flash. So, we’ve been doing the next best thing — hunting them down and showing no mercy. The tomatoes are in a single row this year, staked to a length of wire fencing that leans away from the plants at about a 20-degree angle. The good thing about this set up is that we can simply move along the row, noticing the tell-tale droppings that indicate a tomato worm is probably somewhere above. 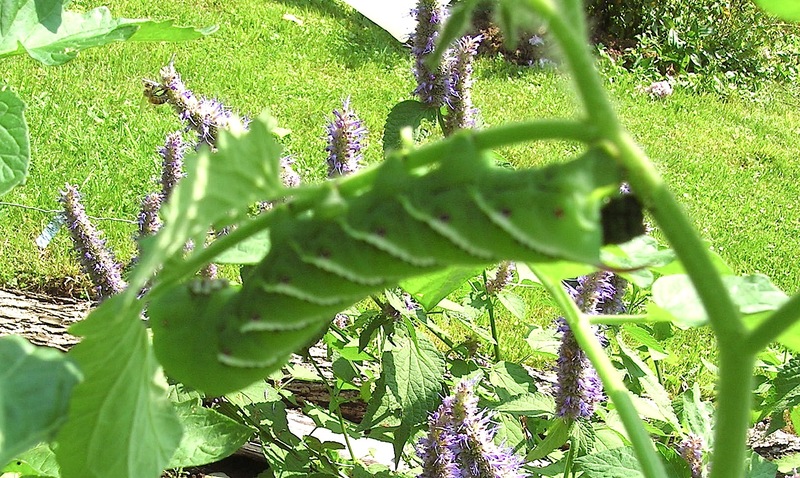 Almost impossible to see among the foliage, you have to admire the tomato worm for its ability to camouflage itself. If you’ve ever tried pulling a tomato worm off a tomato plant you know how intimidating that can be. Some of them are as big as my thumb, and those little suckers are strong! 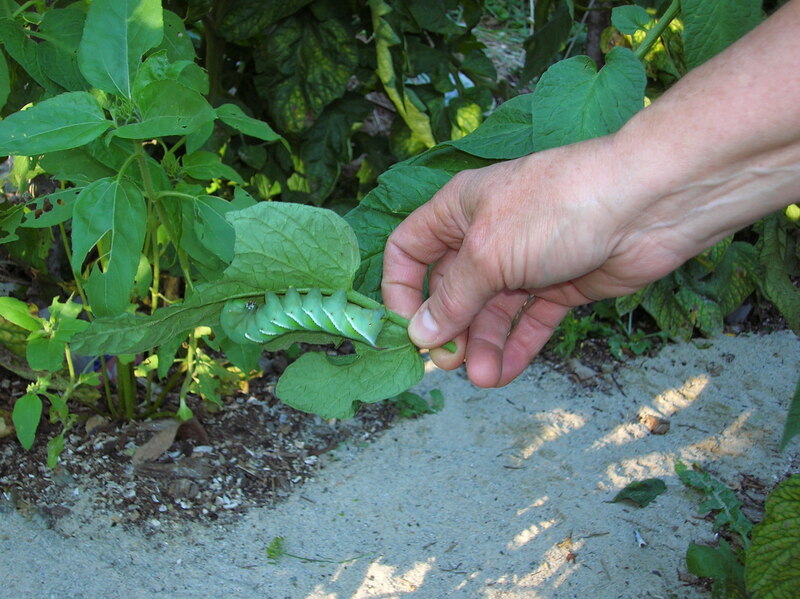 Once you pry it from the tomato, you’ve got to do something with the thing or it will just crawl back onto the plants. Better yet, go after them armed with a pair of garden clippers. Just snip the worm in two and the job is done. Then be sure to brush the droppings off the foliage as you move along to the next plant. By doing this you’ll know you’ve dispatched that one and can now move onto the next. And don’t worry, there will be a next one, and another, and another… Just move along from plant to plant, methodically searching out the worms where you see the dark droppings, (hint: the worms are usually not far above where the droppings show up) snipping them and brushing the droppings away. For the next week or so, check the plants regularly until you don’t see any more of the droppings. With luck you’ll get them before they finish off your tomatoes. Good luck. It’s been raining all day and no one is complaining. After nearly a month without rain, everyone seems happy to see the wet relief. Even so the gardens have been doing just fine, with a bit of extra irrigation. We’ve been picking cherry tomatoes for more than a week now, still getting tender and sweet lettuce, some spinach, cucumbers finally and a few bush beans. We had to pull all the climbing beans after some disease stopped them in their tracks. Re-planted, the climbing beans are making up for the delay and we are hoping for some of those in a week or so. But back to the rainy day. I made use of the forced time indoors by making some raspberry jam first thing today. The raspberry harvest has been good this summer, but because it takes two quarts to make a batch of jam, I stash daily pickings (usually a pint or so) in the freezer until I accumulate enough. This is the third batch, and you cannot imagine how wonderful fresh raspberry jam if you’ve never made some yourself. 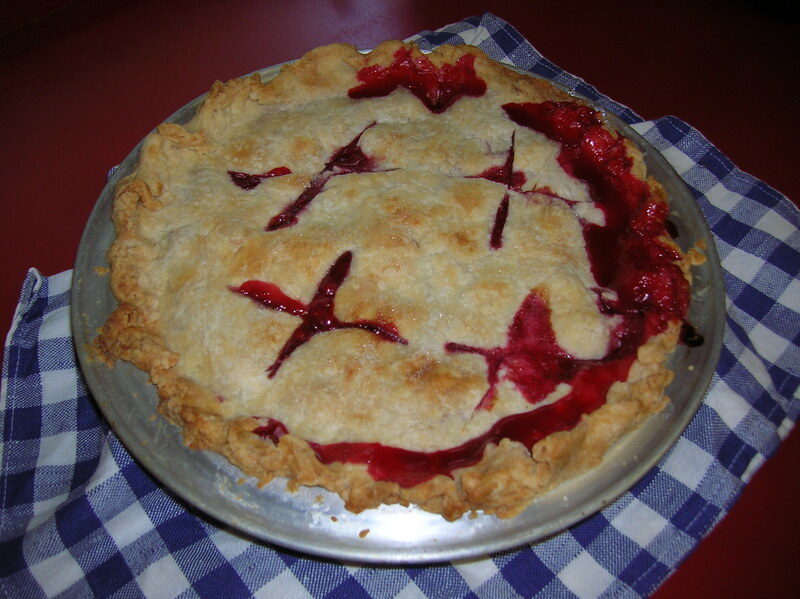 When we have extras, I’ll make a pie and that is what I consider the ultimate luxury treat. But this is also blueberry harvest time here in Maine, and those little jewels are another luxury to enjoy. To celebrate that harvest (which is one of the best in years with 95 millions pounds predicted) I made some blueberry muffins to go with a garden salad for dinner. But they weren’t just any muffins, they are my version of the official competition recipe for the 2012 Union Fair & Maine Wild Blueberry Festival. It is the recipe for the Kid’s Cooking Contest. Everyone makes the same recipe for the judging in the coming week. Because I didn’t have all the ingredients listed, I had to improvise. The results were great, and I’d guess this is one of those bullet-proof recipes. The muffins were big and had great color, and of course delicious too. Try ’em. Combine all the dry ingredients in a large bowl. In a small bowl, whisk together the sour cream, molasses, canola oil and eggs. Fold the egg mixture into the dry ingredients until just mixed. Fold in blueberries, being careful not to over mix. Spray a 12-cup cupcake pan with cooking spray and divide batter between cups. Bake at 400 degrees for 20 minutes or until muffins spring back when touched lightly in the center. In a medium-sized bowl, whisk together the olive oil and next seven ingredients to make dressing. Fold in tuna, beans and tomato halves. Chill at least one hour and serve. Makes four servings. Variations: Add thinly sliced sun-dried tomatoes, sliced Calamata olives, quartered canned artichoke hearts, diced celery, chopped green or red pepper…whatever you like! It’s something we look forward to every summer —blueberry season — and it’s finally here. Ninety-five millions pounds, that’s the estimate of this year’s Maine wild blueberry commercial harvest. Whether you are enjoying some of that bumper crop of wild blueberries, highbush blueberries or are working with frozen berries from the freezer section, there are plenty of treats that call for blueberries. Here’s an easy recipe for hearty oatmeal pancakes that we often serve for dinner. Rich and satisfying, they go together quickly. In a medium-sized bowl, combine dry ingredients. In a small bowl combine the yogurt, eggs and canola oil. Stir in nutmeg and combine with dry ingredients just to moisten dry ingredients. Add blueberries last, folding in carefully. Using a quarter cup measure for each pancake, grill at medium-low heat until bubbles form on top. Turn and continue to cook slowly until set and browned. Serve with butter, maple syrup or raspberry jam. Makes about 10 medium pancakes.